This page contains links to all the Airshow Moment posts on this site. These moments are some of my personal highlights of the previous season and may well include some older airshow moments looking back. These are usually posted every Sunday. Mid-Air Squadron Canberra PR.9 at Abingdon – A look at the return of the English Electric Canberra to the airshow circuit back in May. 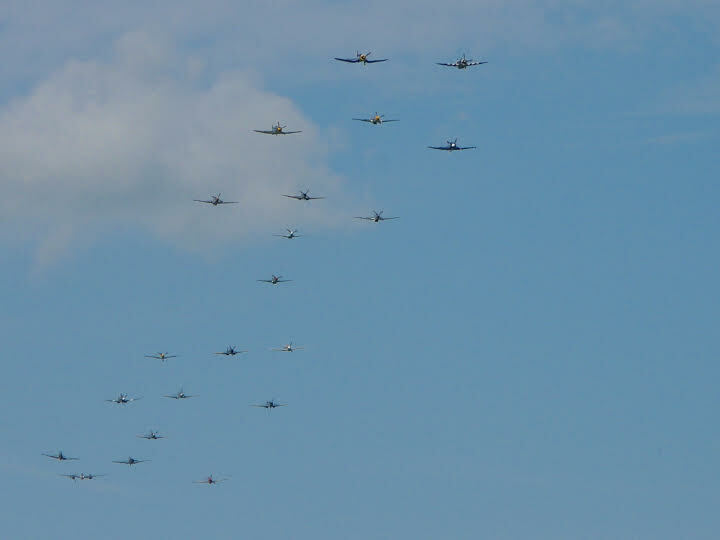 Dakota Gathering at Duxford – A look at the gathering of 5 C-47s at Duxfords D-day anniversary show in May this year. P-26 Peashooter at Flying Legends – This year saw the first and probably last appearance of the Planes Of Fame Museums Peashooter outside of California, this post takes a look back at the event in July. Off Season Survival Tips – A Look at some of the winter activities available for airshow goers. 2014: A Bumper Year For Airshows – A look back at one of the best airshow seasons in recent times. Hellcat’s Return – A look at the return of The Fighter Collection’s Hellcat to the Uk Scene. Ghosts of Airshows Past 1: Flying Legends 2004 – A look at how much the airshow scene has changed since 2004. The Flying Legends Joker – A look back at the traditional Joker slot during the Flying Legends displays. Ghosts of Airshows Past 2: Woodchurch Wings and Things – A look back at the now finished Wings and Things Shows at Woodchurch. Avro 3 (4) Sisters Meeting – Short report on the formation of two Lancasters and the Vulcan which took place at RAF Marham earlier this year. Ghosts of Airshows Past 3: London City Fun Days – A look back at the London City airport airshow, sadly no longer an active event. Old Flying Machine Company Pair – A look at the impressive close formation displays of the Old Flying Machine Company. Duxford VE Day Airshow Practice Day 22nd May – A brief photo post accounting the day before the big VE day airshow. Duxford V-Force Tour – Photo post covering the Vulcan’s brief visit to Duxford on the 28th June. There was also plenty of activity from the based warbirds.